At first it was hard to believe the thermometer. And to overcome the months-long habit of layering on the outdoor clothes. After two days of sweltering through my run with too many too heavy clothes, however, it was finally sinking in. It really was warm out! With temperatures well below zero just days ago, and beautiful cross-country ski conditions still a vivid memory, we can be forgiven our inability to grasp the sudden change in season. But it didn’t take long for all of Duluth to head outdoors to enjoy the transformation. And I love watching the parade. The Lakewalk is virtually a highway of pedestrians. Dog walkers, high school track teams, runners and baby strollers are in abundance in colorful garb. Nobody seems to mind sloshing through the inevitable puddles or crossing the streams that flow over the pavement. The faces I pass are all smiles. Brighton Beach is populated with folks of all ages, taking in the rapidly shrinking ice formations on the lake. Close to shore there are still remainders of the ice shards that were once piled so high, now surrounded by watery pools on top of the rapidly melting ice. 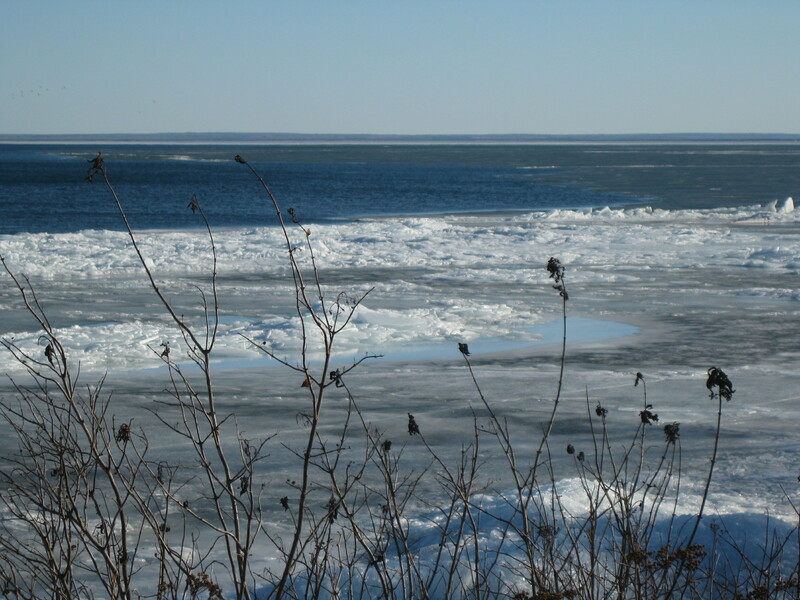 Further out, the ice is turning darker as it thins. Plenty of ice houses attest to the fishermen’s belief that it is still viable. But you’ll never find me venturing out there. Open water is rapidly advancing toward Duluth. While Lake Superior reached over 90% ice coverage just a few weeks ago, it opened up quickly with the wind and sun. The edge of the ice field has now retreated all the way down to Brighton Beach. Last week the thought of the Coast Guard ice breaker beginning its duty on Monday seemed outlandish. By the time we saw her out plowing through the ice, it seemed perfectly natural. One could already imagine spotting boats out on the horizon heading for the Aerial Bridge. At 57 degrees this afternoon, I just had to hop on my bike and head up the North Shore. I was hardly alone. Cyclists were whizzing up and down the Scenic Highway, exchanging friendly waves and nodding. Sure the shoulders were still full of gravel, but it was a small price to pay for the vast pleasure. Like the rest of them, I too was grinning and loving it. Of course, everyone knows this is Duluth. Winter isn’t over until it’s over. But I did happen to stop in a ski shop this afternoon, and was startled to find the wall of cross country skis barren and empty. All put away to make room for bicycles and other summer gear. It was instant spring in there too. 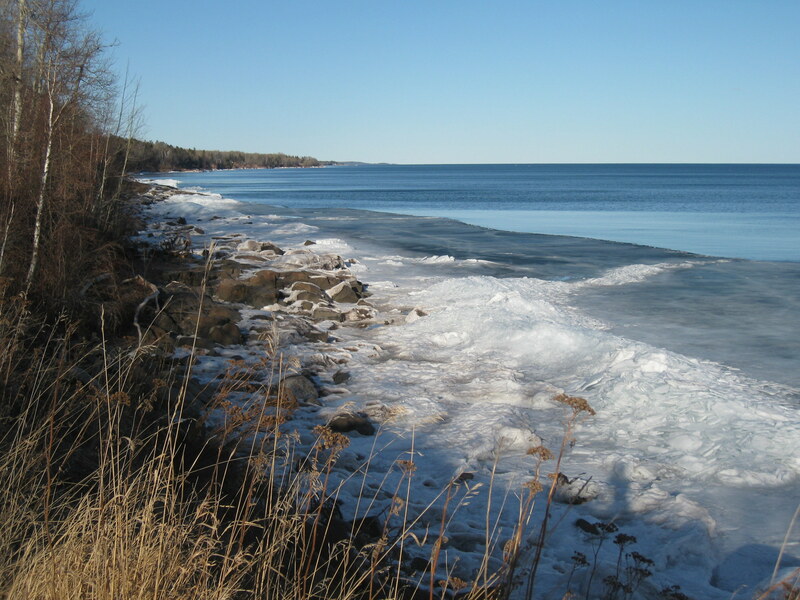 This entry was posted in Outdoors and tagged Duluth Minnesota, Lake Superior, North Shore, Outdoors by Molly. Bookmark the permalink.